Right now we’re all happily being soaked by the remnants of Hurricane Rosa. Washes are filling up, and desert life is getting a much-needed last, big drink before we go into another relatively-dry Arizona Winter. But this is a lot of rain, and rattlesnakes don’t have the weatherman to help make wet weather plans for the week. This can cause rattlesnakes to show up in some unexpected places during the next week or so. Most rattlesnakes in the low desert have been busy doing their fall activities – eating, mating, and generally moving around a lot to get everything done before it’s time to laze-away cooler months. They often use washes and drainages, take cover under large rocks, rodent burrows, and similar situations. Unfortunately for them, when a rare event like regional flooding suddenly happens, this can cause rattlesnakes to be flooded out of their temporary hideouts. Rattlesnakes are often displaced by a major storm event in this way, and may end up moving erratically as they search for place to get out of the elements. Don’t panic, just be strict with snake safety and be aware. For homeowners, that means that your garage, covered patio, wood pile, or even car can become temporary shelter. If you live near a wash or drainage, especially, rattlesnakes will have to come to higher and dryer ground, so any available cover may be used. Even places that aren’t especially great rattlesnake refuges can become a port in the storm. Temporary or often-moved items like trash cans and parked cars, even boxes by the door, can become temporary shelter. For hikers, it means that you may see rattlesnakes crawling in times and conditions that you don’t expect. If you avoid hiking at certain times of day hoping to not see a rattlesnake, the “rules” may be shaken up for awhile. In any case, rattlesnakes that you encounter still won’t chase, jump, or attack, or any of the silly stuff people believe. Follow hiking rattlesnake safety recommendations and be aware of your surroundings. Do not be overly alarmed, but do exercise extra caution during the next several days while rattlesnakes adjust to having their house flooded. As always in rattlesnake-activity areas, be aware of your surroundings and follow general rattlesnake safety protocol. Be extra aware of the area around your front and back doors if you have an overhang. If you have pots or decorations in these areas, pull them away from the wall to open the space up. If you are cleaning up debris from the storm, use heavy gloves and tools. Never reach directly into the sticks and leaves that pile up after rain water recedes. Rattlesnakes may be using this debris as temporary cover, so treat it as you would any other bush or potential rattlesnake-hide. When you let your dogs out to use the bathroom, go with them. A dog on a leash is seldom bitten by a rattlesnake. Talk to your children and remind them of basic rattlesnake safety, and accompany them when playing in the backyard. If you do have debris in your yard, give it a day or two before going in to clean it up, but don’t let it stay too long. Rattlesnakes that are displaced or flooded out by the storm may be using debris as temporary cover, but in most cases this is not suitable for them when things heat up again. If you have rattlesnake fencing installed, check it out to make sure there have not been any wash outs. If you see a washout, contact your installer to have it repaired as soon as possible. Be aware that not just rattlesnakes are displaced by the high water. Nonvenomous, harmless species also may make a surprise appearance after a watery eviction. If you’re not familiar with the snakes that live in your area, it may be time to brush up on your snake identification skills. Every monsoon season, a handful of big storms that sweep through the valley and rearrange our yards and shingles. The next day, an chainsaws and leafblowers join the sound of cicadas as the aftermath is handled. Along with the downed trees and trash-scattered streets are rattlesnakes that have been displaced by the water and wind. After a massive storm, places where rattlesnakes may have been hiding from the heat can be flooded or destroyed. That means that these snakes have just a few hours to find new places to hide before the daytime heat kills them. That often puts them into conflict with people. One of the places where rattlesnakes frequently live during the hottest times of year are in small caves along the edges of normally-dry washes. When these washes fill with water, rattlesnakes need to move. For home owners at the edges of these washes, that means that the rattlesnakes could be moving to the nearest dry area – your patio. Covered patios and entryways make up the majority of rattlesnake relocation situations after rainouts. They’ll also be hiding in the debris caused by the wind and flooding. Fallen trees and collections of yard debris are going to provide cool cover for these displaced snakes, and should be treated with caution when they are cleaned up. The extra humidity also causes rattlesnakes to be more active, so they are already more likely to be hiding in temporary hiding spots, and may be more easily displaced by the big rain. Rattlesnakes are shedding their skin and heading out to hunt and drink after a long period of inactivity during the hottest and driest time of year, and that makes post-storm movement even more of a factor for home owners bordering desert areas. Aside from the normal rattlesnake safety measures, extra caution is recommended during the cleanup process. What should you do to keep safe from displaced rattlesnakes? Be alert around covered entryways and patios, especially in the corners. Rattlesnakes often use these covered areas to hide after extra-wet weather forces them to leave more preferable areas. If you have any decorations in the corners, like pots or plants, it may be good to move them out or at least create extra space between the corner and these features. Especially in the early morning, be mindful of the spots right around the front door. If you have downed trees or yard debris that has collected after the heavy wind and rain, give it a day before cleaning it up. Be mindful while you do so of the potential for rattlesnakes to be using it as temporary shelter. Rattlesnakes may be “stuck” in situations where they need to quickly choose places to hide from the daytime heat that are not preferable, and may end up hiding in piles of branches and fallen leaves. By waiting 24 hours, you give the snakes a chance to leave if they are there during the next suitable time to do so (at night). If you live near a wash or drainage, be especially cautious. Rattlesnakes are very common in drainages and the rain can force them to move erratically, often taking cover at the nearest available shade – your house. Accompany dogs outside during their bathroom breaks and give the yard a quick check before allowing children to play in unprotected yards. If possible to let them out earlier in the day while it’s still hot, that may further decrease the chance of an unwanted rattlesnake encounter. If you do not already have a rattlesnake-protected property, consider having a rattlesnake fence professionally installed to keep rattlesnakes out even during periods of irregular behavior. If any rattlesnakes are seen on the property, do not approach them and call a professional to help. 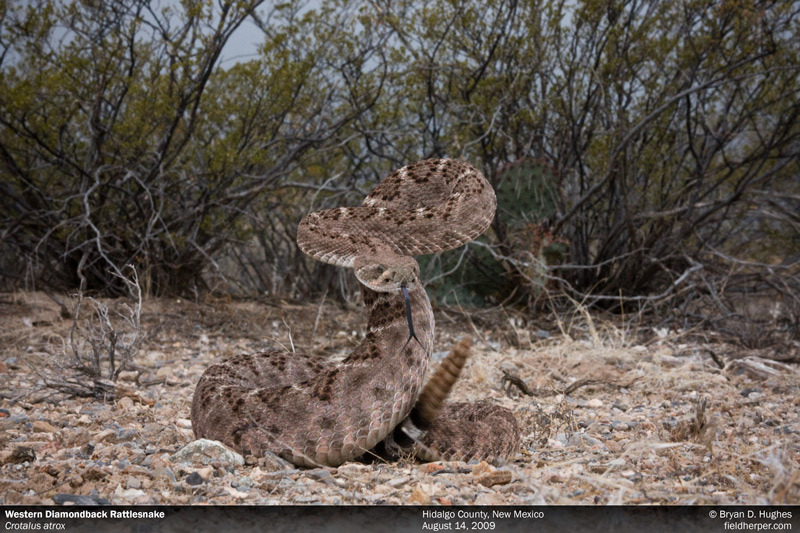 More than the monsoon – rattlesnakes may be surface active in any temperatures, any time of year. Something that surprises many home owners each year are sightings of rattlesnakes after Winter rainfall. While it is true that rattlesnakes are largely inactive during the cooler months of the year (roughly November through February in the Phoenix area), some conditions will make them show up at any time. Heavy rain can cause similar displacement issues for rattlesnakes if it gets into places they’ve selected to spend the winter … especially if these are temporary, artificial, or new sites. Other than displacement, rattlesnakes still need to drink in the winter time. Even in relative low temperatures for rattlesnake activity, they may come to the surface to collect rain in their coils or drink it directly from the rocks. Here’s a video I took years ago at a small Timber Rattlesnake den, showing one of the several present rattlesnakes coming out to drink from the rocks. If you have a rattlesnake denning on your property, you have a decent chance of seeing it sitting on the surface as the rain starts, or just after if the storm breaks to sun. 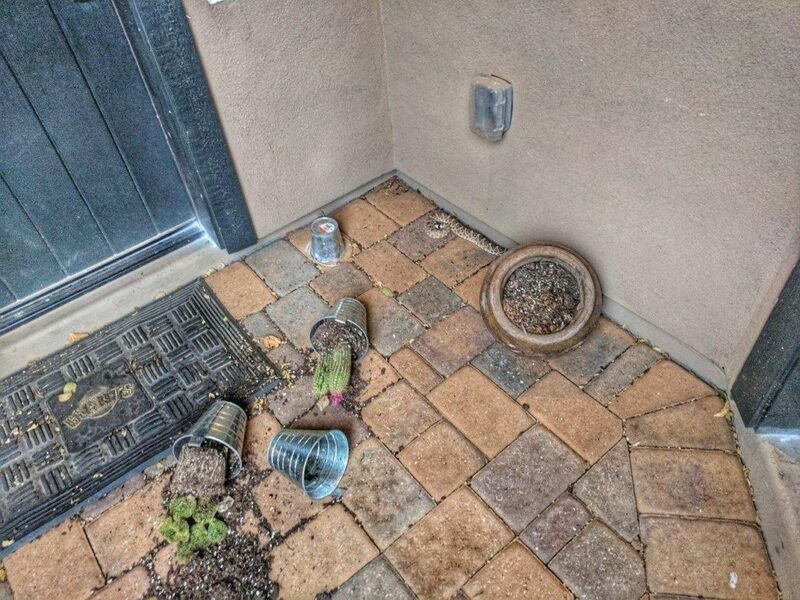 What most people don’t like to learn about these situations is that the rattlesnake has almost certainly been in the area since about October, just hidden until having a reason to come out. All in all, rain is just one of the many factors that make rattlesnakes move and be visible to people. Many people move to Arizona for our near-constant sunshine, and mild winters. These also make for perfect conditions for reptiles, which to the dismay of many homeowners, live in great numbers throughout the state. 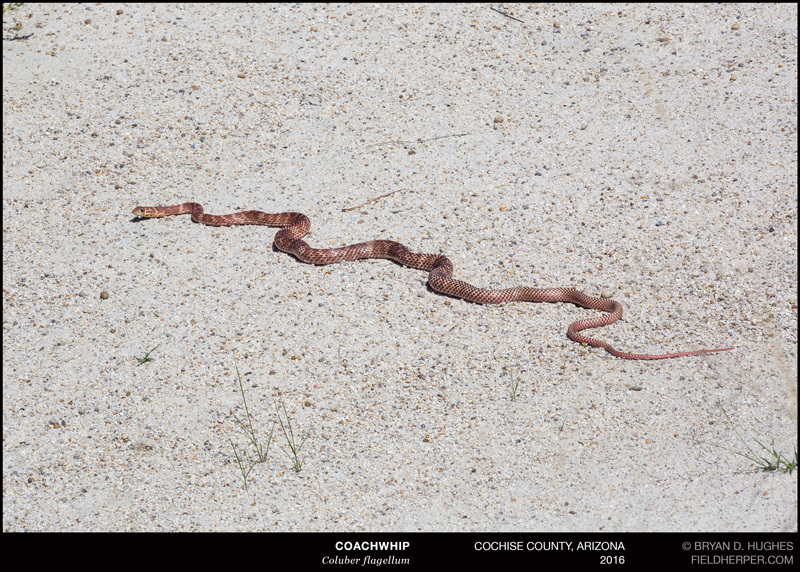 Where our neighborhoods meet the desert, an encounter with a snake every so often is just part of life. The valley is home to 6 unique species of rattlesnake, all of which pack a harmful, venomous bite. A bite, which if logic prevails, is almost always optional. 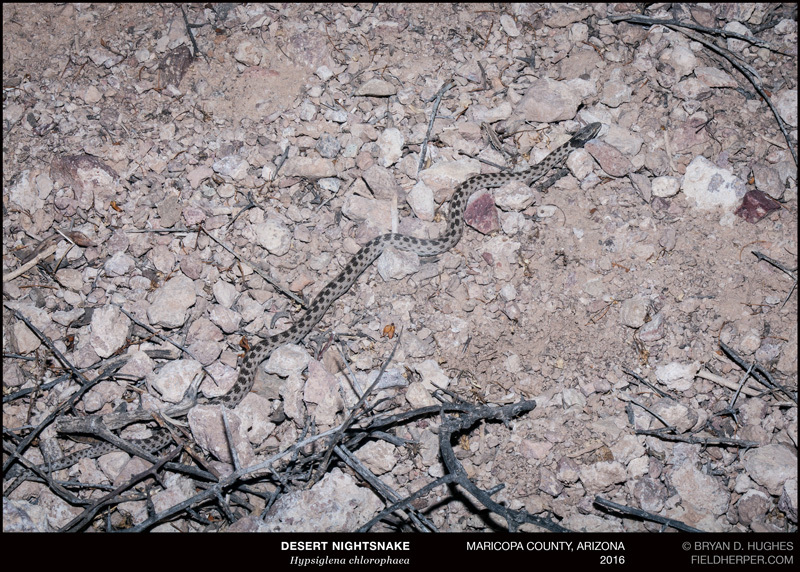 Rattlesnakes are on the menu for many desert predators. They’re nervous, shy, and like most animals, will try to prevent their own death when it is threatened. 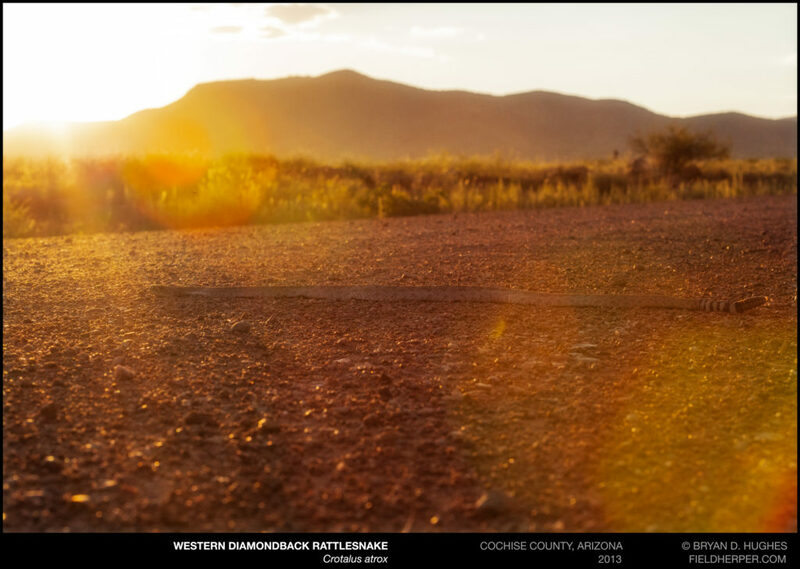 Rattlesnakes do not chase, jump at, or come after perceived predators, regardless of the numerous, fictional tales we as Arizonans are sure to hear. The fact is; rattlesnakes encounters are almost always harmless if in nature, and optional in our yards. So what is the home owner to do, when a venomous visitor suddenly drops by one morning, coiled on the porch and going nowhere? The first thing to consider: nobody is in danger. The snake has been seen, and the only way anyone will be within range of a bite is if they put themselves there. Statistically, this is what many shovel-wielding husbands will do, becoming the single largest bite statistic, by far. A bite to the hand of a home hero can cost well over $100,000, cause incredible pain, and result in disfigurement and occasional death. Contacting a professional to remove the animal costs around $100, and is absolutely safe and humane. The desert is a hard place to live; make sure your yard isn’t an oasis. Rattlesnakes want food, water, and shelter. Deny those, and the yard is nothing interesting. Fix leaky hoses, keep the yard clean, and make sure all of the bushes are trimmed and free of dead plant material underneath. If you have a view fence or wall surrounding the property, complete the barricade. Door sweeps and wire fencing can be installed to keep animals out. It’s a relatively inexpensive Saturday project for the handy, or contact a snake removal company to install it for you. Forget the store-bought snake repellents and mothballs; they simply do not work. Many pest control companies will swear they do, but all research points to repellants being a smelly waste-of-money. Dogs can be trained to avoid rattlesnakes by a number of businesses around the valley, and an inexpensive vaccine can be requested by most veterinarians. Keep dogs on a leash in desert areas, and have emergency information on-hand if you live near open, native desert. Despite the very high number of snakes that are found here, bites still make the front page when they occur. It is a relatively rare event with an extremely low fatality rate, which somehow still occupies a place in our culture as a major threat to be feared by every desert home owner. As citizens in this amazing Sonoran habitat, it is the responsibility of all of us to be peaceful, well-informed co-inhabitants with the desert wildlife. Rattlesnakes may be the thing of nightmares to many, but that is an optional fear that, like most fears, fades to nothing with a willingness to learn and a touch of understanding. 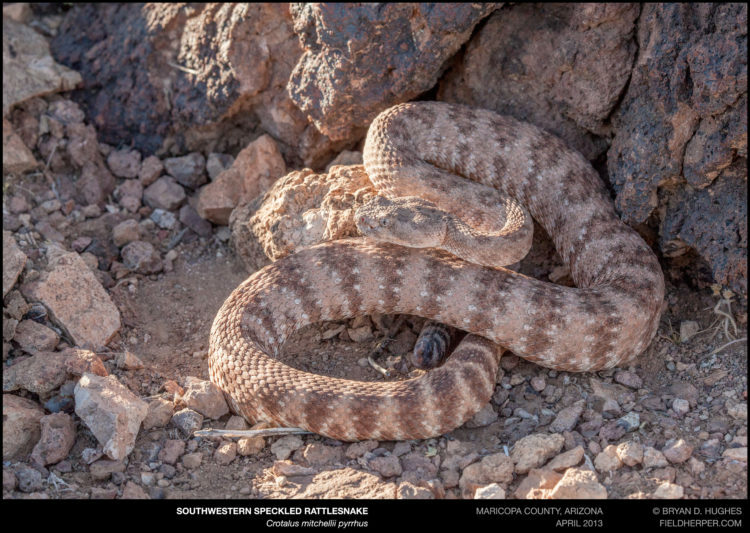 In the valley, the most common places to run into a rattlesnake in your own yard are Cave Cree, Scottsdale, and other areas where there is a lot of development and contact with native areas. VENOMOUS – Grey to tan in color, between 1’ and 4’ long. Easily identified by the distinct white and black banded tail, and rattle. Defensive in nature but easily avoided if encountered. Do not attempt to capture, kill, or otherwise interact with this snake. BENEFICIAL – Also commonly misidentified as a “bullsnake”. Tan, yellow, or orange in color, with dark brown blotches, between 1.5’ and 5’in length. Defensive if attacked, but non-venomous and will not bite unless attacked. A gophersnake is great free pest control. BENEFICIAL – Grey or dark brown with double rows of spots on the back, between 8” and 14” in length. Often confused with a baby rattlesnake due to elliptical eyes and triangular head. Absolutely harmless, this snake feeds on spiders and scorpions in the yard. VENOMOUS – Highly variable, this snake takes the coloration of rock where it is found; orange, brown, white, or light grey. It is small, between 1’ and 3’ in length. If seen, do not approach this snake for any reason. BENEFICIAL – Often confused with the kingsnake, this snake is between 8” and 3’ long. It eats lizards and their eggs. They are absolutely harmless, and can reduce rattlesnake-attracting prey in a yard. BENEFICIAL – Black and white banding from head to tail, and between 1’ and 4’ in length. 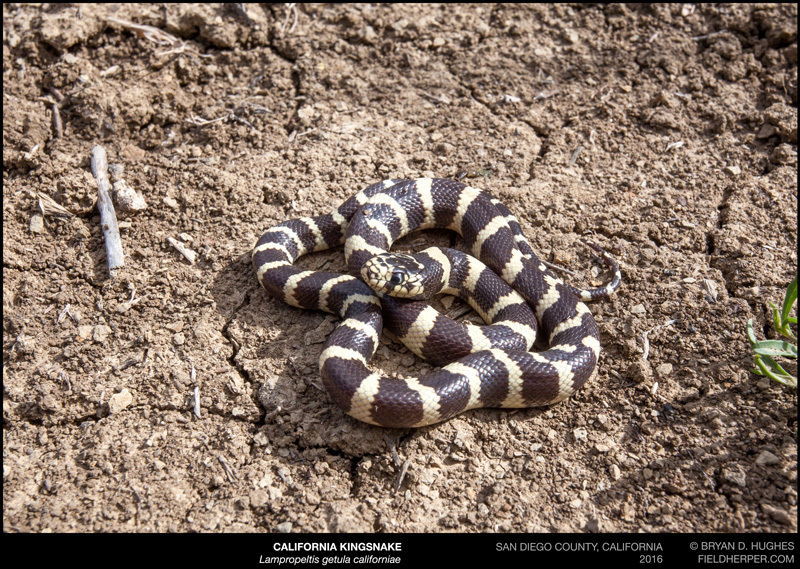 Kingsnakes consider rattlesnakes a primary food source, and are great to have on a property. They may bite if picked up, but are otherwise completely harmless. BENEFICIAL – Fast, slender, and between 1’ and 5’ in length. May be black, olive, or red in color. This snake eats rattlesnakes and other prey items and should be kept as-is if seen. They will bite if picked up, but move away quickly if seen and are difficult to capture. Each year, rattlesnakes emerge from Winter dens and start making an appearance. While the weather each day or week does influence what the snakes do when they are ready to come out, it doesn’t have as much of an impact as most people think. Take this year, for example. We got hot, early. February saw temperatures in the low 80’s for days, and the calls of “rattlesnakes are coming out early!” were all over Facebook. A few people saw them while hiking or sitting outside a garage, and that seems enough to make the declaration. Were they really coming out early, though? Not at all. Along with those 80F highs were overnight lows in the high 30’s … that’s a temperature swing of almost 50 degrees in a matter of hours. For snakes, this means that at around 11am, when they would otherwise be sitting out on a reasonable February day, they face a situation where the rocks are lethally hot on top, and too cold to move underneath. To associate rattlesnake behavior with warm temperatures simply because they are cold-blooded is an extreme oversimplification of their behavior, and “warm weather = snakes!” is just not true. What does happen, and certainly did this February: warm weather brings out more people. More hikers on the trails means more chances for an encounter. The Western Diamondback Rattlesnake dens that I monitor each year to see how activity is progressing tell the tale. This year, rattlesnakes came out right on time in January, but spent less time overall active on the surface throughout February. Even now, their social activity at the dens seems sluggish and limited to only a short amount of time, compared to this time in previous years. Our rattlesnake removal hotline is deader than dead as rattlesnakes are just not liking something with this weather. 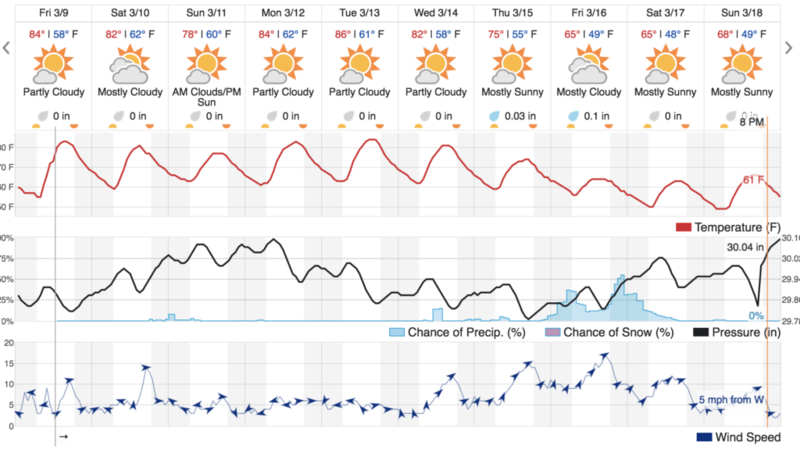 But … the weather this week looks like everything is about to change. Instead of focusing on how hot each day will get, I look at how cold it gets at night, and how much it changes … and how quickly. It looks like we’re about to start hitting temperatures in the 60’s each night, and do so consistently for several days. That is the signal I look for, and I would bet that after the little bit of moisture coming in later in the week, rattlesnakes are going to be making an appearance on social media pages all over the place. About time! It’s finally cooling off out there and rattlesnakes have mostly ended their surface activity for the year. They’ve gone to their Winter dens to wait out the cooler temperatures – but those dens can often be places close to (or in, under, or next to) home. If you live in a place where rattlesnakes do, especially if you have had rattlesnake encounters near the property, it’s good to have a little bit of information for visiting friends and family who aren’t as savvy as you are. This isn’t meant to scare anybody away (or may be it is! [insert mother-in-law-joke here]), but create just enough awareness to make sure everyone has a good, safe time and there’s nothing to worry about for those grand-babies from cooler climates. Do a pre-visit check of the yard for rattlesnake activity. This one is a no-brainer. A couple of days before they arrive, spend a half hour looking around the yard to see if there’s anything suspicious. Shed snake skins, odd holes that weren’t there before, and weird-looking poop could mean there’s a rattlesnake that’s decided to spend Winter in your yard. Places to be especially aware of are pool-filter areas, near and under sheds, and in the garage. If you live in a manufactured home, or a home with easy access to the foundation, that’s another area to look. If you’re not sure, this is something that we can help with. Just a simple awareness statement. When everyone arrives, just give a quick statement about being aware. A quick “Just so you know, rattlesnakes do live around here, so always keep an eye out” will do, and may give you something to talk about on the way home from the airport. You might want to go over some of the basic rules of living in the desert that you do every day. Things like “don’t reach anywhere you can’t see” and “don’t go outside at night without shoes and a flashlight“. Different relatives may have different tolerances for all the snake talk, so feel it out and give the appropriate amount of information to keep everyone safe without ruining turkey day. Keep the kids out of the garage. After Thanksgiving is a common time for people to get into the storage to dig out Holiday decorations. Rattlesnakes commonly use garages as den sites (this is something we handle all Winter long), so be aware that stuff that you haven’t touched all year, i.e. dusty decorations, are great places for these sleepy snakes to hang out. While the actual hanging of decorations might be fun for the family, actually retrieving them from storage is a better solo job for you. If you are within a quarter mile of any construction project, be especially aware. Many rattlesnakes that we are called to capture during the Winter have been disturbed at their chosen Winter refuge, and end up wandering into nearby neighborhoods trying to survive. If there is any construction project nearby, including road expansion, or and minor residential construction like digging a pool or removing an old shed, be especially aware. When native desert is torn up, the animals that have lived there have no choice but to find a new place to go, regardless of how cold it is outside. If you are in this situation, you may want to give an extra note of caution to your visitors. If you have a snake fence, check it out. Are there any holes in it? Are you using the right size mesh? Are all gaps 1/4″ inch or smaller? There’s no better time to check out the snake-proofing work than before visitors arrive, so you can confidently say that the yard is protected. Here is a simple test you can do at home in a few seconds to see if your snake proofing is doing its job. Keep our 24/7 hotline number available. 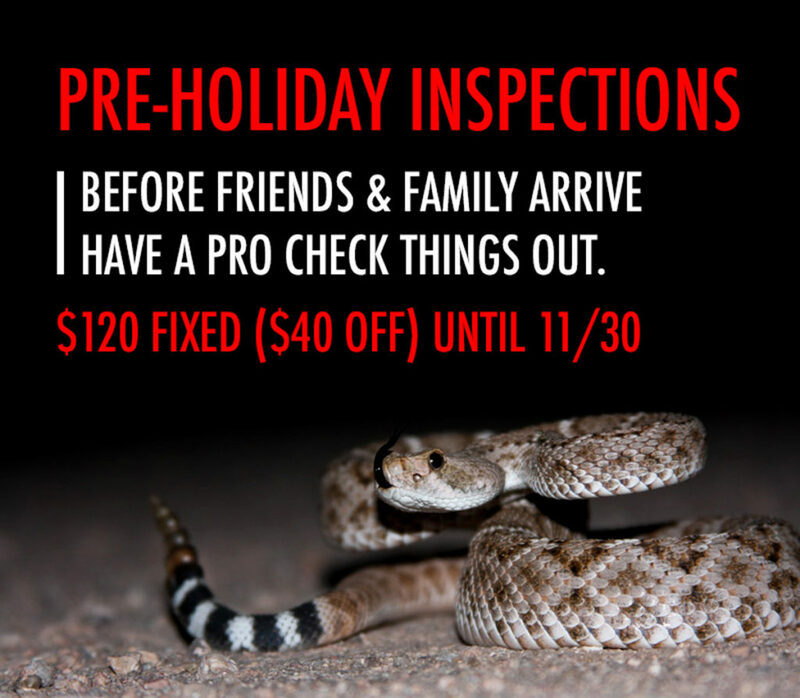 In the event that a rattlesnake does show up while family is there, be ready to handle it in the safest and most effective way possible: call an expert to help (nobody wants to spend the holiday in the hospital ICU). 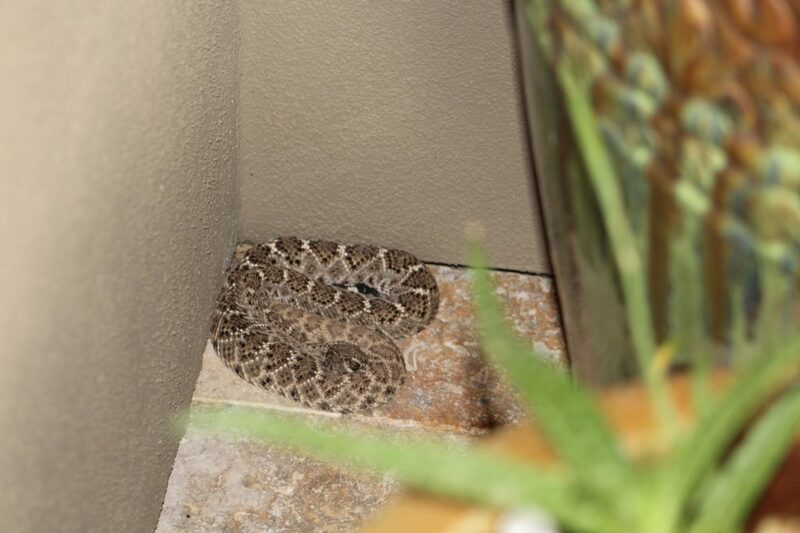 If a rattlesnake does show up, call 480-237-9975 any time for immediate removal. To help, we have a seasonal discount on Property Inspection Services for the rest of November. 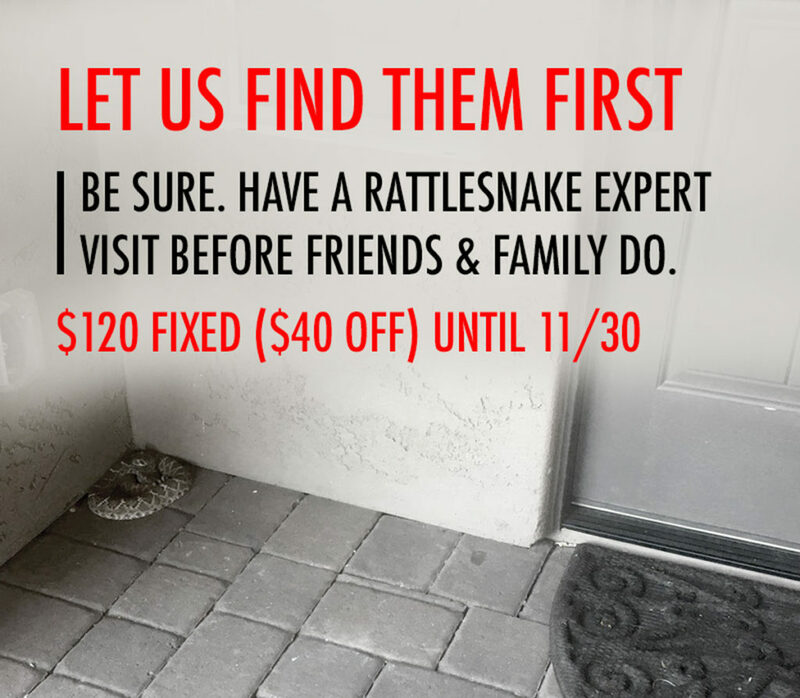 If you want to have a rattlesnake expert come to your property and check things out before friends and family arrive, call 480-237-9975 or email info@rattlesnakesolutions.com. Same-day service is available in most cases upon request. It’s 119F outside. Where are the rattlesnakes? Each year, when temperatures are highest and humidity is lowest, rattlesnakes mysteriously disappear from hiking trails. Our snake removal hotline is quiet, and people are more worried about keeping the air conditioning running than rattlesnakes. But rattlesnakes are cold blooded, don’t they like the heat? A comment I often see on Facebook threads is that snakes love heat, the hotter the better, and when temperatures soar over 100F is when they are happiest. Really, this is completely wrong, and reptiles have just as much trouble in this excessive heat as other animals. It’s even deadly in many cases, and so they do what you’re probably doing right now while reading this: hiding someplace cool and waiting for it to end. If a rattlesnake doesn’t have a good place to hide when it is this hot, it’s in big trouble. A rattlesnake will die when its body temperature gets too far above 110F (Klauber, pg 418-420). If you try and get the mail barefoot at 9am, you know how tough it is for them. This also means that at temperatures reaching 119F like it did yesterday, just being outside in the shade is lethal to most snakes. They have no choice but to find deep cover and wait it out. This is a method of estivation; reptiles hide in cool, safe places until conditions are more favorable. You’re probably familiar with hibernation, where animals hide from extreme cold until Spring … this is similar in concept, but in this case, an escape from hot, dry conditions. While it’s this hot, rattlesnakes hide and wait for the rain to come cool things down. Where do rattlesnakes hide when it’s hot? Rattlesnakes choose anywhere that offers stable, cooler temperatures as estivation sites. This could be underground in rodent burrows, natural caves in drainages and mountains, or riparian areas with higher humidity than surrounding areas. They can also choose man-made spots to hide, like under homes or in abandoned buildings. A common place that we find them this time of year is in the garage, which is nothing but a cave if left open at night or not properly sealed. They may also use cool, wet areas in the backyard to beat the heat, like shaded pool filter areas and decorative landscaping. Generally, however, this time of year is low-activity for rattlesnakes, and you’re not as likely to see them out and about. 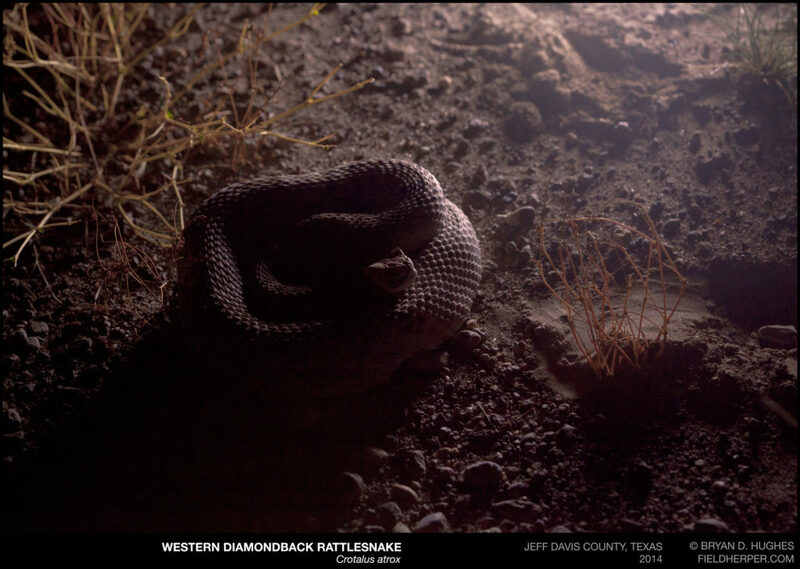 Some rattlesnakes do make an appearance at night outside of their chosen estivation sites, hoping for the one source of water that may be available to them: rodents. Some native rodents can actually produce water from seeds that they eat, meaning that to a rattlesnake, eating is the best way to get a drink. If you know where to look, these brutal conditions can have a restrictive effect that makes finding rattlesnakes incredibly predictable. When do rattlesnakes go back to their normal activity? When the monsoonal rain comes to the desert, the higher level of humidity brings stabilization to temperatures. That’s the signal to leave estivation sites and get out there. What happens next is the busiest rattlesnakes will be all year, from about mid-July until October, when they eat, give birth, and are generally quite active. Much of this activity is still at night when temperatures are more reasonable, but they are often seen in the early mornings on trails, and in the case of at least a few people each morning, on the front patio. But for the next few weeks, rattlesnakes have much in common with the people of Arizona, and are indoors complaining about the heat and texting their friends in cooler climates with photos of their car thermometer freakout. Well, in spirit anyway. 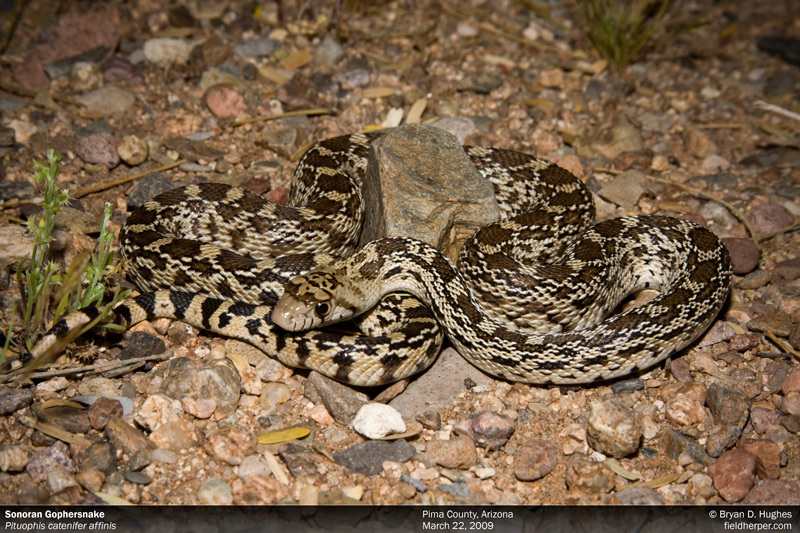 One of the most beautiful snakes in the world is also one of the most common to see in the Phoenix area. 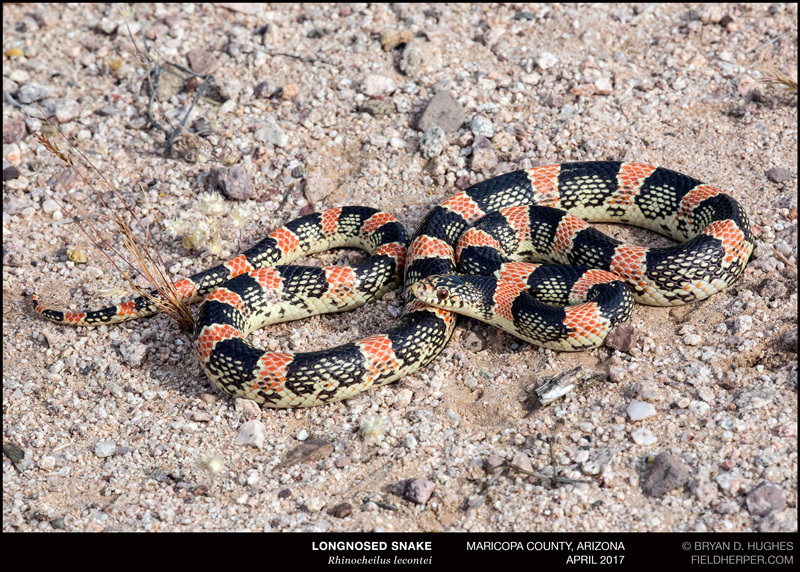 Their specialized color adaptation is so strong that snakes found on the South side of Phoenix are completely different than those from the North valley. 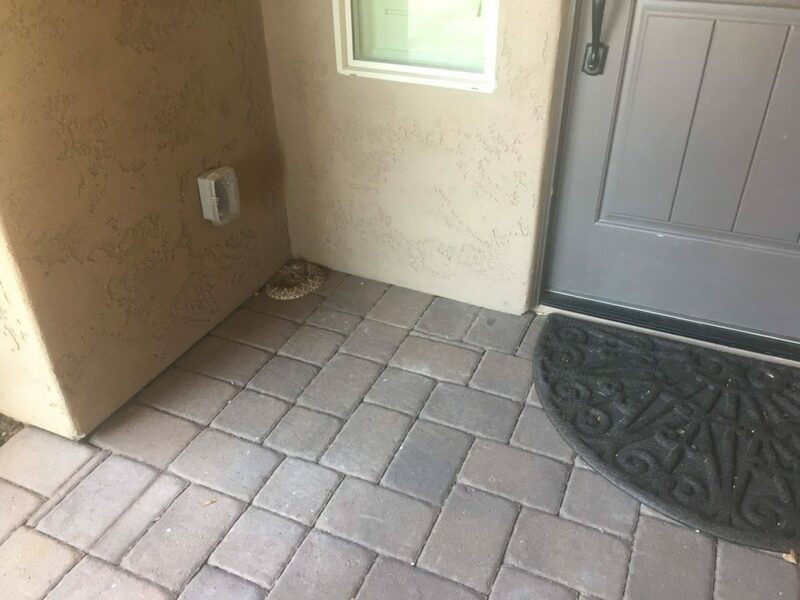 Even though these may be the most common rattlesnake on South Mountain, most Ahwatukee residents that we serve have never seen one until the moment one has shown up in the yard.